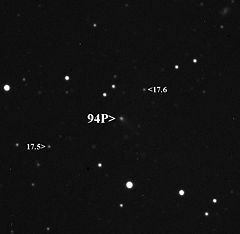 94P/Russell 4 is a periodic comet in the Solar System. It fits the definition of an Encke-type comet with (TJupiter > 3; a < aJupiter). It was discovered by Ken Rusell on photographic plates taken by M. Hawkins on March 7, 1984. In the discovery images, Russell estimated that the comet had an apparent magnitude of 13 and a noticeable tail of 5 arc minutes. In the year of discovery, the comet had come to perihelion in January 1984. With an aphelion (furthest distance from the Sun) of 4.7 AU, comet 94P currently has an orbit contained completely inside of the orbit of Jupiter. In July 1995, 94P was estimated to have a radius of about 2.6 km with an absolute magnitude (H) of 15.1. It may have a very elongated nucleus with an axial ratio of a/b >= 3. ^ a b c d e "JPL Small-Body Database Browser: 94P/Russell 4" (last observation: 2009-12-25). Jet Propulsion Laboratory. Retrieved 2010-02-19. ^ "94P/Russell Orbit". Minor Planet Center. Retrieved 2014-06-17. ^ a b c Seiichi Yoshida (2008-10-25). "94P/Russell 4". Seiichi Yoshida's Comet Catalog. Retrieved 2010-02-19. ^ a b Snodgrass, Colin; Lowry, Stephen C.; Fitzsimmons, Alan (2007). "Optical observations of 23 distant Jupiter Family Comets, including 36P/Whipple at multiple phase angles". Monthly Notices of the Royal Astronomical Society. 385 (2): 737–756. arXiv:0712.4204. Bibcode:2008MNRAS.385..737S. doi:10.1111/j.1365-2966.2008.12900.x.